Both sexes: Dark brown upperparts, can be paler underneath. In flight, short neck and broad wings. In flight, the Buzzard seems very short-necked, has a relatively short, broad tail and has broad wings with fingers - this reduces turbulence (see flight). The wings are held in a shallow "V" when soaring. When perched they look as though their head is hunched into the shoulders. 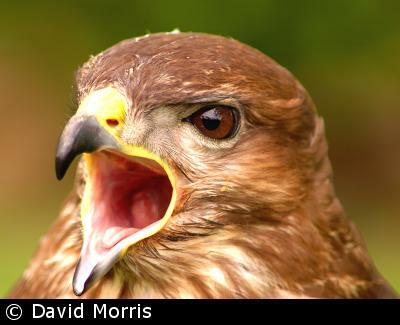 The Buzzard's plumage can be very varied, but it is typically dark brown above and below. The breast is finely barred and can be pale, and the underside of the wings and tail are pale. There is usually a pale band on the breast. The tail is lightly barred. Juveniles are usually lighter underneath. The Buzzard is common in western Britain. However, the breeding bird surveys of 1968-72 and 1989-91 clearly show that they are spreading eastwards in mainland Britain and becoming more common in Ireland. The Buzzard has a loud drawn-out mewing call. They feed on small mammals, like voles and rabbits, but also birds, reptiles, amphibians, insects and worms. 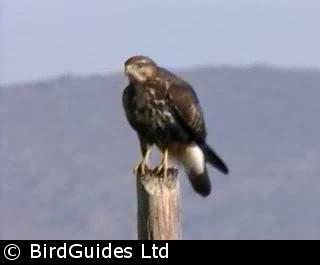 Often they can be seen perched on gate posts or branches from where they can lookout for prey. Alternatively, they scan open ground while soaring. Buzzards nest in trees, in woods, on farmland, moors or scrub. The nest is usually made from twigs and lined with moss and bracken. Frequently, the same nest is used year after year. The male and female take turns incubating the eggs. The eggs are about 55 mm by 45 mm, smooth and non-glossy, white with brownish or purplish blotches. Both adults feed the young birds, though the newly-hatched are usually fed by the female with the male hunting and bringing the food to the nest. The Buzzard is mainly resident, but some do migrate to eastern Britain in the autumn where they spend the winter. Buzzard populations are slowly recovering to their original levels before they suffered an appalling decline caused by unlawful persecution and myxomatosis among rabbits, its chief prey. Sadly, the birds are still persecuted with some dying each year from poisoning.